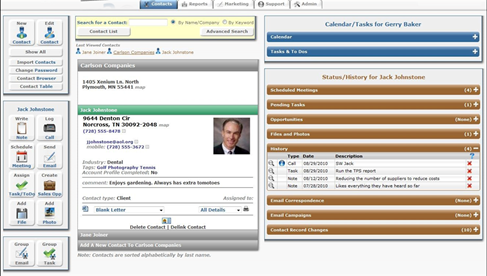 BigContacts is a traditional CRM like SalesForce or Highrise. The actual interface of BigContacts has plenty of modern features, but the visual stylings of the design definitely feel a little out-of-date compared to Highrise. Why even include BigContacts on the list? Two primary reasons. First, they offer a non-profit discount (contact them for pricing, but their single-user plan pre-discount is $19/mo). Compared to Highrise’s (limited) free plan, it’s still expensive; but it’s unlimited, and compared to the unlimited paid plans at Highrise and SalesForce, this is a great deal. Traditional CRM features: Like SalesForce and Highrise, they allow you to track interaction history and a wide array of information about each contact. Jason: Even though BigContacts lacks any fundraising context (like the other pre-made CRMs), Jason is working to make a system that makes BigContacts as workable as possible for staff. Awkward Design: I know I’m a design snob, but I would love if BigContacts took some design hints from Highrise. No built-in financial information: Despite Jason’s efforts to integrate giving information, the spreadsheet he creates is still external, and cannot integrate with BigContacts. Therefore, this solution has both contact management and financial management–but not together in one place.